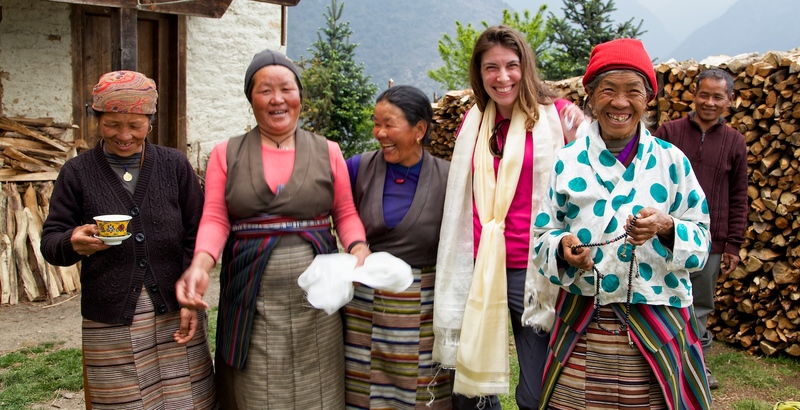 How do you know when travel impacts you deeply? Which journeys give you the most powerful memories? 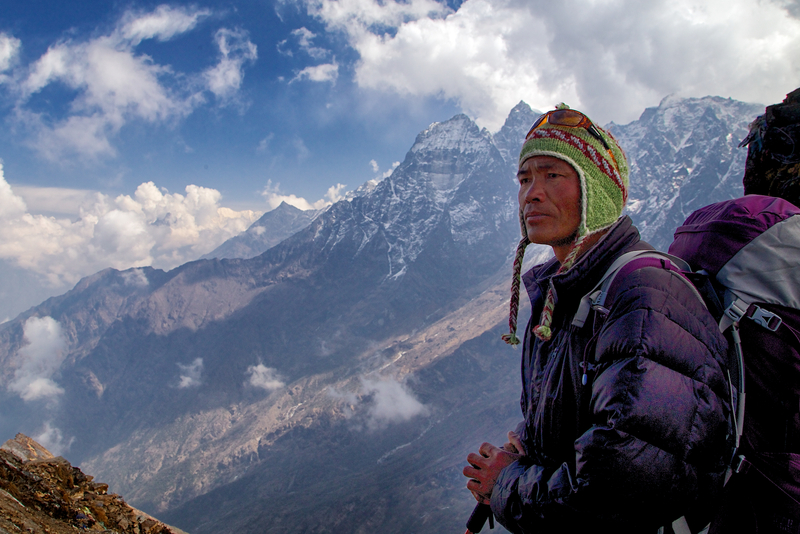 These thoughts have been bouncing around my mind furiously since I returned from Nepal. 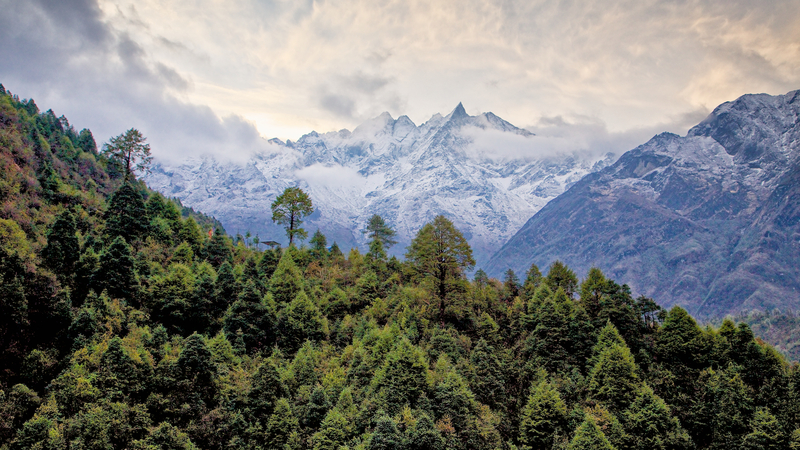 Nepal left a deep imprint. Every time I ask myself why, the answer is simple. The people. 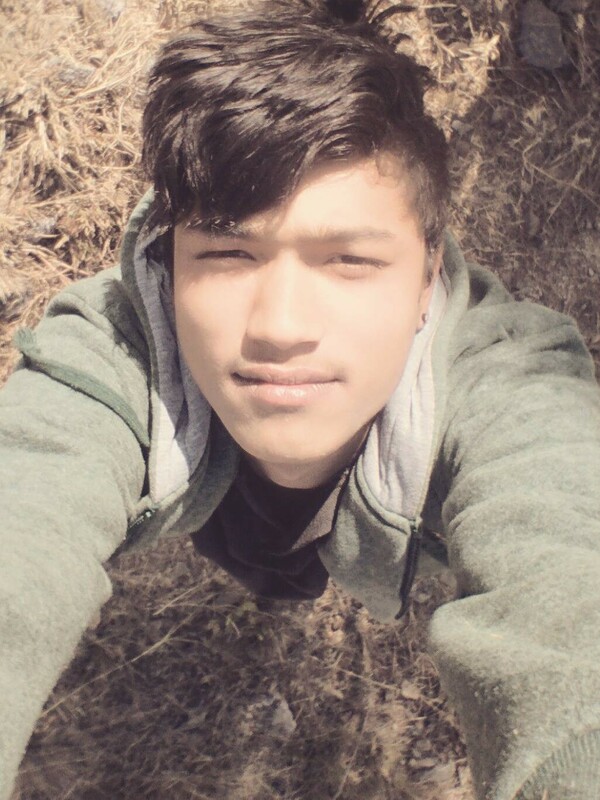 I met Ashok Bhujel, a young Nepali man in his early twenties, one day as I returned to my guesthouse in Changu Narayan. He helped with all sorts of daily chores around the guesthouse. He greeted me with a warm smile, and open arms. I could not even begin to have a want before he would anticipate it and help me out. Ashok is a dreamer who likes to think about the possibilities for his friends and family. I got to know Ashok better over the next three weeks. He is a dreamer. Whether he was inviting me to sit with his friends and trade songs on his guitar, or teaching me about the political, educational, and economic struggles of younger Nepali generations, Ashok dwells on the possibilities, not the barriers. I have been keeping touch with Ashok occasionally. It was his messages to me a couple weeks ago that both gave me great relief that he was ok and sadness for his upcoming struggles. 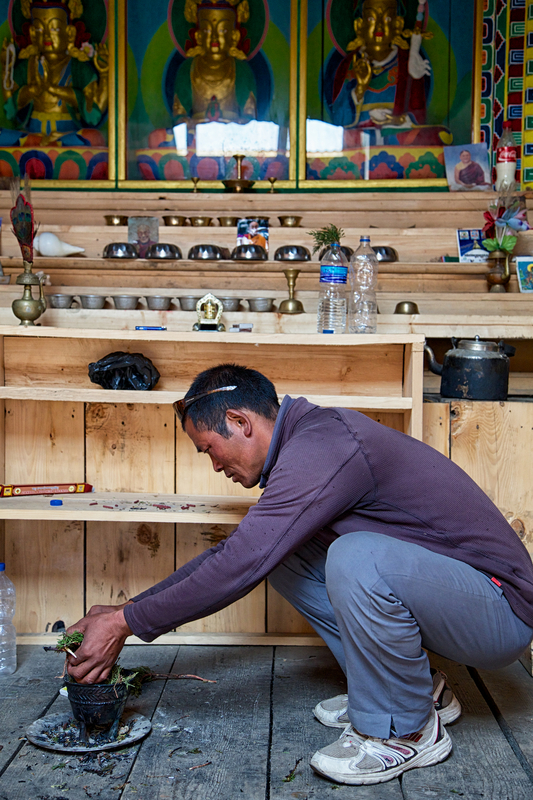 Ashok, like so many in Nepal, has lost everything – his home and his job – due to the earthquakes. He has a new wife, Nena. 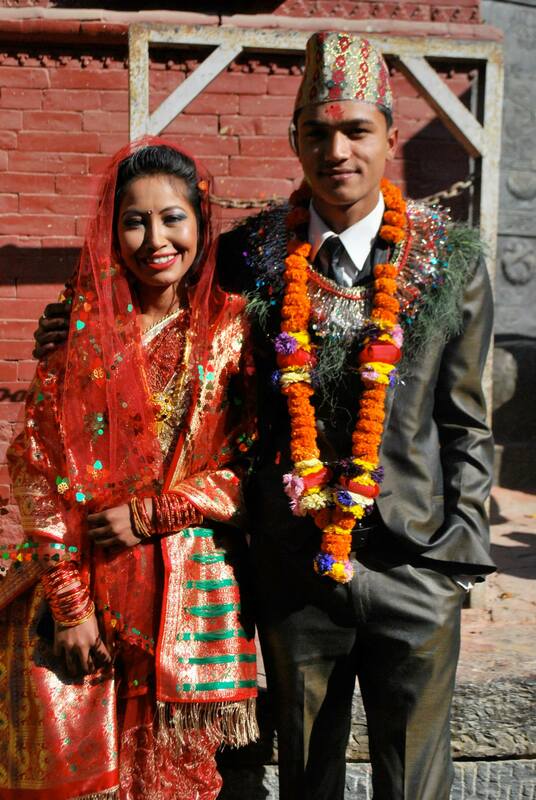 Together, they were starting their life together in Kathmandu when the earthquakes struck. Rather than relay his story to you, here are his own words from our recent conversations. I asked him to tell his story, so I could share it with you. “Okay Luke Iet me start. Well I was working in starview and she had a singingbowl healing centre in Bhaktapur Dattariya. One day I took one of my costumer to her centre and then I meet her. Her name is Nena Nepali. “And one day she took me to her home I met her parents. They had a small shop too. Her parents and her 3 yrs old brother all are very nice people. After that slowly I talk about her with my parents. They want to meet her too. Ashok and Nena on their wedding day. “But I didn’t have still home to stay. So I was sitting. With her parents. Life was going slowly okay u know but now my sweet home in village is no more. My family is staying under tent. I don’t even know. Do they getting foods or not. My wife shop is also gone and with that all her hard work and dreams too. Ashok and Nena are some of the many people in Nepal that will receive help from the donations you make to our GoFundMe fundraiser. Please contribute today. Many have asked to see some footage from the trip. While there is still a mini-mountain of files to go through, we wanted to share some moments from the first third of the trip, so you can see what it was like on the trek. We figured this would be a nice compliment to the regular blog posts. There will be more footage coming soon, including the official promotional trailer. Stay tuned! Karma Documentary Teaser from Luke Mislinski on Vimeo. Two entire days in a row of actual rest can have a strange and unexpected effect when on a multi-week trek in the mountains. My legs had not felt worn out or sore at any point on the trek. 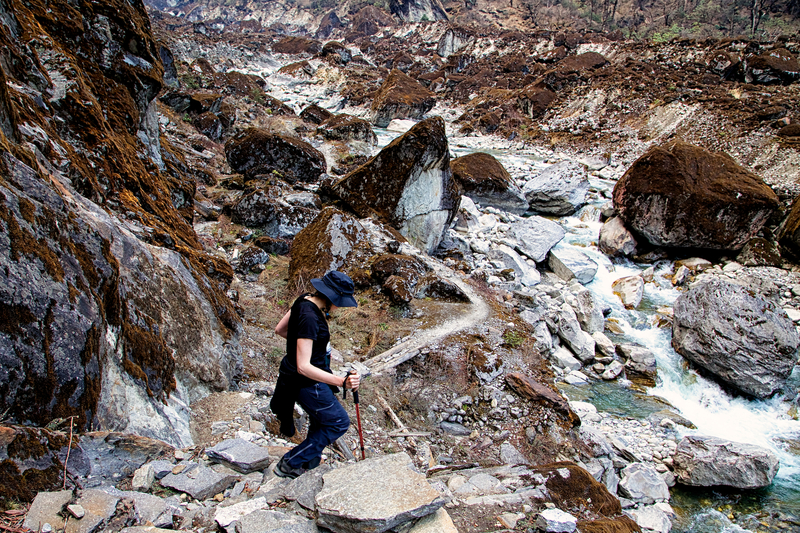 However, my legs were stiff and sore when we hit the trail to make our way back to Lukla. This was a nagging detail in the back of my mind, because our two day return to Lukla would be arduous. Our return would be shorter, because we were taking a “short-cut” over the Zatrwa La pass. 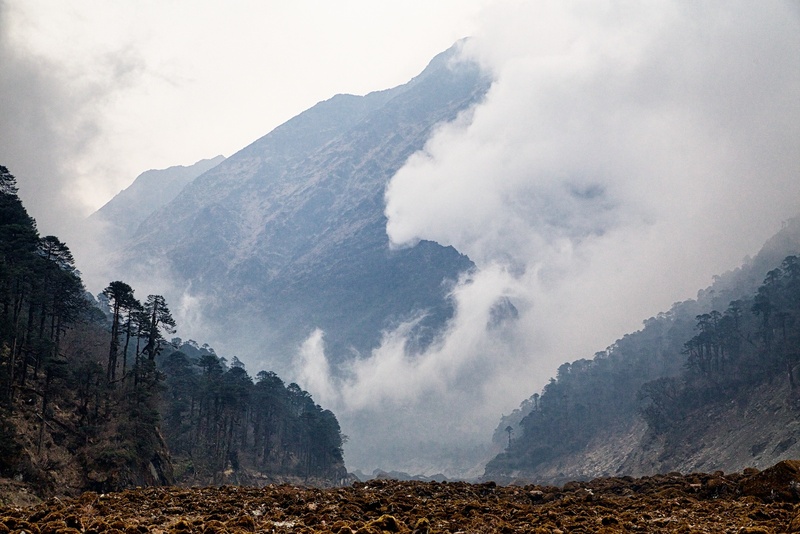 However, we would have to descend first to about 11,000 feet and then climb up and over a very steep 15,120 pass feet before descending down to Lukla at 9800 feet. “Nothing like waiting until the end to do a burley pass”, I thought, as my legs begrudgingly worked their way down the trail. Our last night in Khote was beautifully clear. Just before lunch, we made it to Takto. It was clear that the members of the group were starting to move more at their own pace the last couple days. Matt and Andrew, being the fastest and strongest, were far ahead of the rest of us. Christen and I, like usual, were still bringing up the caboose. We still wanted to keep moving, though. 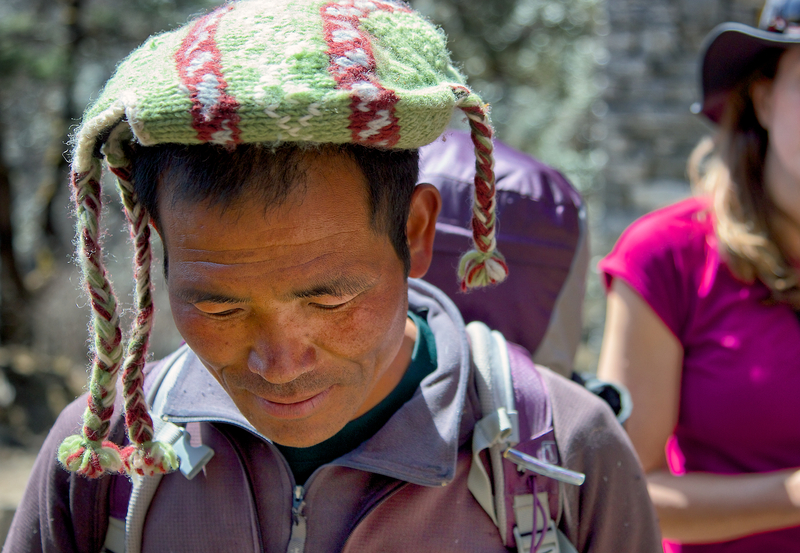 We opted to move ahead of our porters while they ate lunch and eat snacks as we hiked. It felt good to get a little bit ahead, since we frequently had to stop to rest. The trail after lunch started the very steep climb toward the Zatrwa La pass. Pasang, as always, makes his way down the trail with uncanny ease and grace. 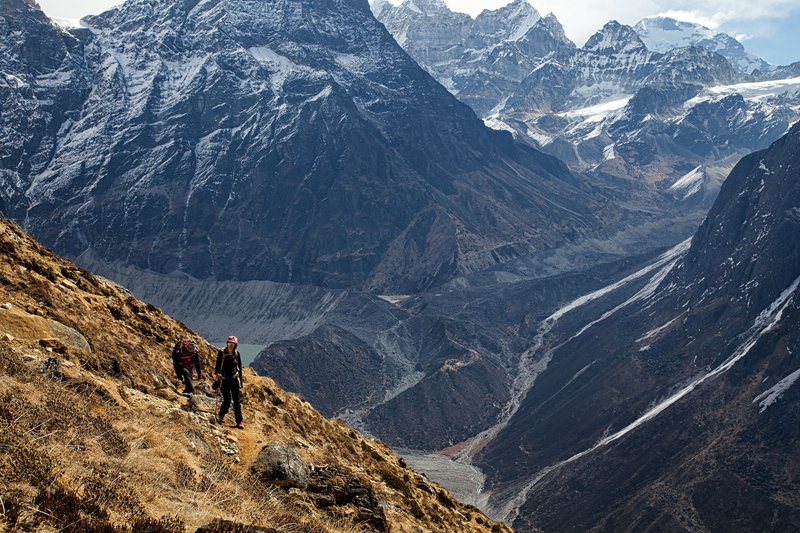 As we continued to climb, the view behind us opened up to staggering perspectives. Mera Peak was prominent in our sight. It was almost as if it were saying goodbye to us. The sun was warm and bright, and the clouds were big and fluffy. Once again, though, the weather started to cloud up very rapidly and temperatures dropped as we continued to climb through mid-day. As we climb toward the Zatrwa La pass, Mera Peak says farewell. In the early afternoon, Christen and I appeared to be nearing the top of the steep climb and crested a ridge. I had gotten myself into trouble with Christen several times by suggesting that we were nearing the end of the day’s hike or the end of the uphill sections when we in fact were not. I almost ended up losing my life on this day. I made the very poor decision to tell her that I thought we were nearing the top of the pass. Not only was I wrong, we had several hard climbs left before reaching our destination for the night, Thuli Kharka, and a significant climb the next morning before reaching the pass. As we continued hiking (upwards) throughout the day and the next morning, Christen seemed to emit a little steam from her ears every time she looked my way. As we got to Thuli Kharka, I made sure to give Christen a little space to protect myself. She cheered up quickly, though, as we made it to the lodge. There was an interesting group of people hanging out, highlighted by a Polish team that had a professional classically trained pianist as their chief diplomat. We had lots of fun comparing trekking stories and drinking tendencies with our Eastern European brethren. As we were all laughing at one of Christen’s jokes, a porter with another group staggered up to the lodge with a load that was at least three times his size. I asked him how much it weighed, and he said it was 60 kg (132 lbs)! So much for legal weight limits for porters… They are supposed to carry no more than 35 kg (still 77 lbs). I was again glad to be working with a company that believes in fair work conditions. 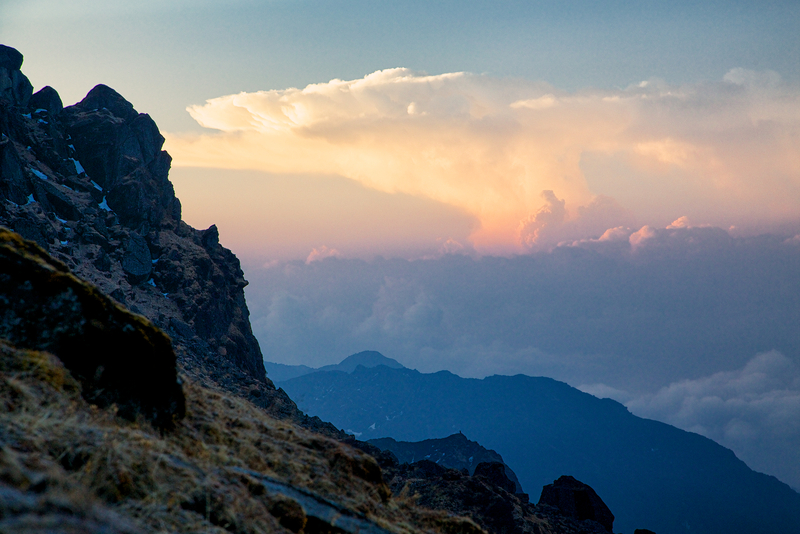 Sunrise at Thuli Kharka, just below the Zatrwa La pass, gave us the perfect start to our last day of trekking. On the morning of the final day, the weather was cold and bright. We were all anxious to get going, though. We had all been through a lot, and getting up and over the last big obstacle was all that was on anyone’s mind. The landscape was very open. There was no-where to hide from the wind. As we neared the top of the pass at 15,120 feet, the wind grew bitingly cold. The trail was also slick with snow in spots. Our normal routine of going fast on the descents had to take a back seat. The last day of hiking would prove to require just as much mental attention as any other. The group anxiously works its way up to the Zatrwa La pass on the last day. 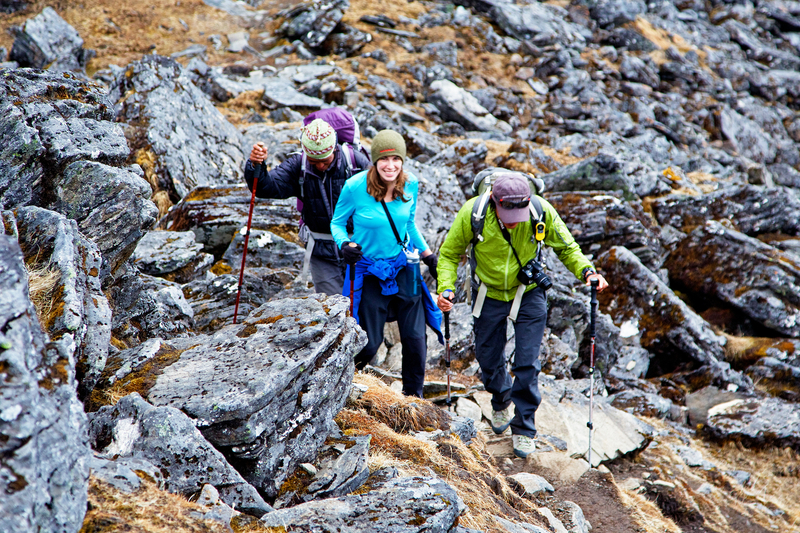 Pasang, Christen, and Karma enthusiastically hike upwards. Karma enjoys the view from the Zatrwa La pass. Pasang takes a break on the descent towards Lukla. Pasang and Christen prepare for the descent to Lukla. 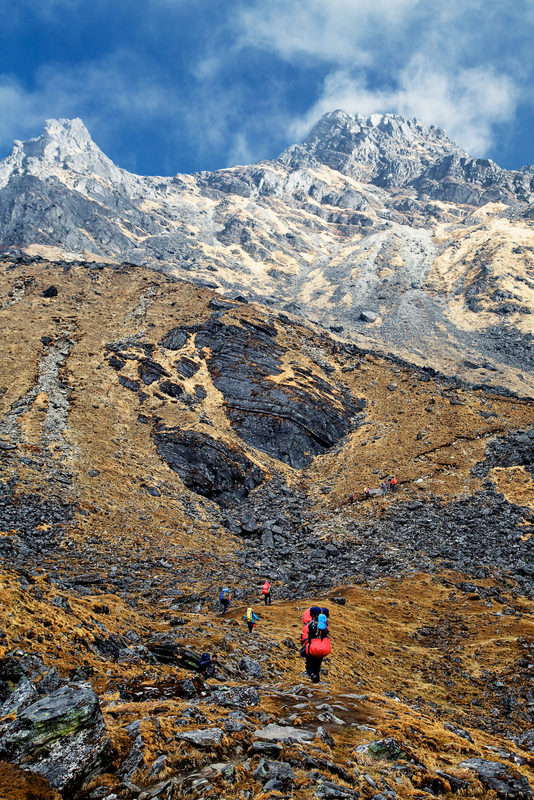 As we made our way down over 5000 vertical feet to Lukla, we were greeted by many trekkers climbing up the pass. They were taking the shorter route to Mera peak over the Zatrwa La pass instead of the more gradual climb we took on the start of our trek. 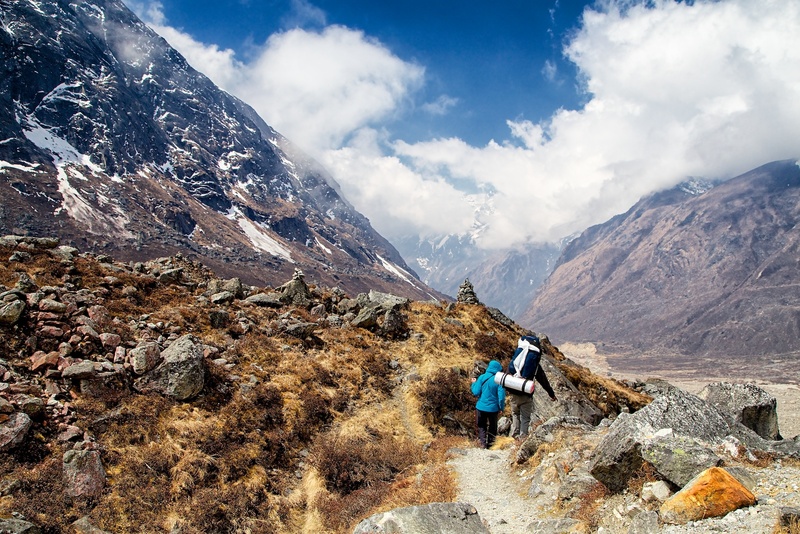 While their route is more direct, it is much riskier for altitude sickness. Many of the trekkers we met were going from Sea Level where they lived to Lukla (9800 feet) to the top of Zatrwa La pass (15,120 feet) in the matter of a couple days. 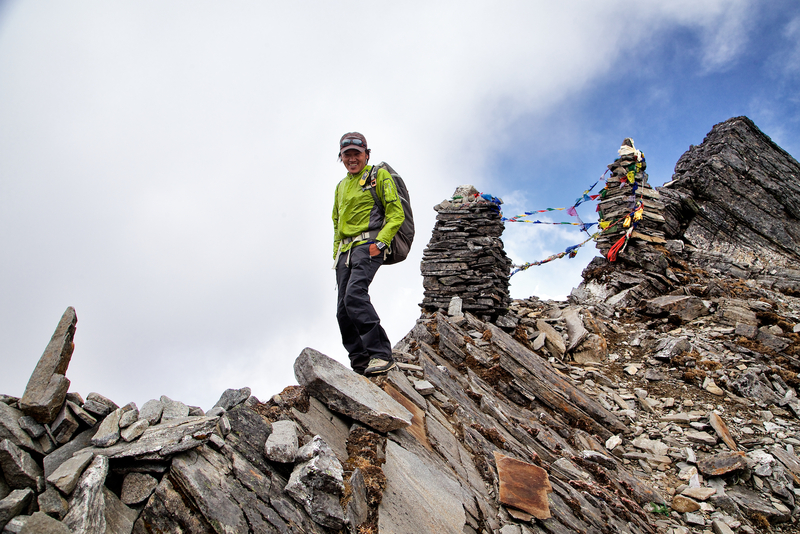 We had run into a trekker several days earlier who had tried this aggressive itinerary and had to cut his trip short due to altitude sickness… I am glad we saved this pass for the end of our trek. The view from the top of the Zatrwa La pass is breathtaking. Just as we were working our way down from the pass toward our lunch stop, a hail and rain storm rushed in from seemingly nowhere. Once again, we were fortunate to be walking up to the tea house just as the deluge began. Thankfully, Glen had one more opportunity to break out his stylish plaid golf umbrella. 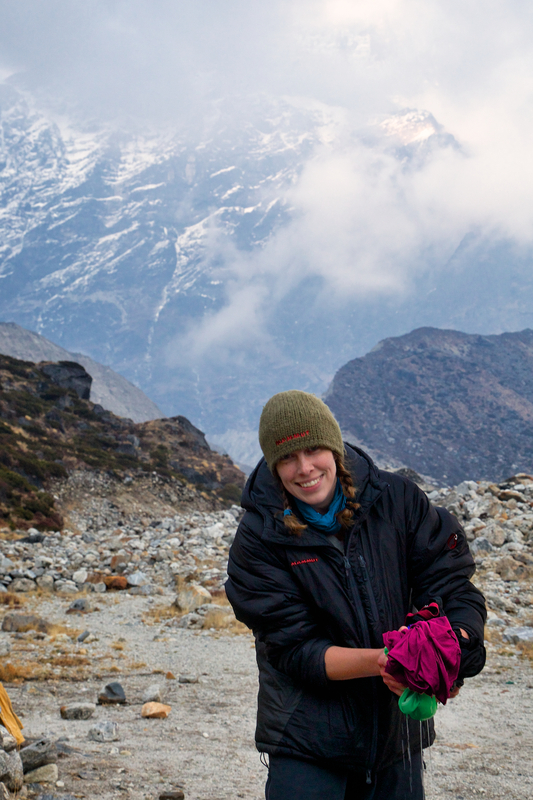 Just as we did through the whole trek, Christen and I decided to get our money’s worth and arrive last in Lukla. 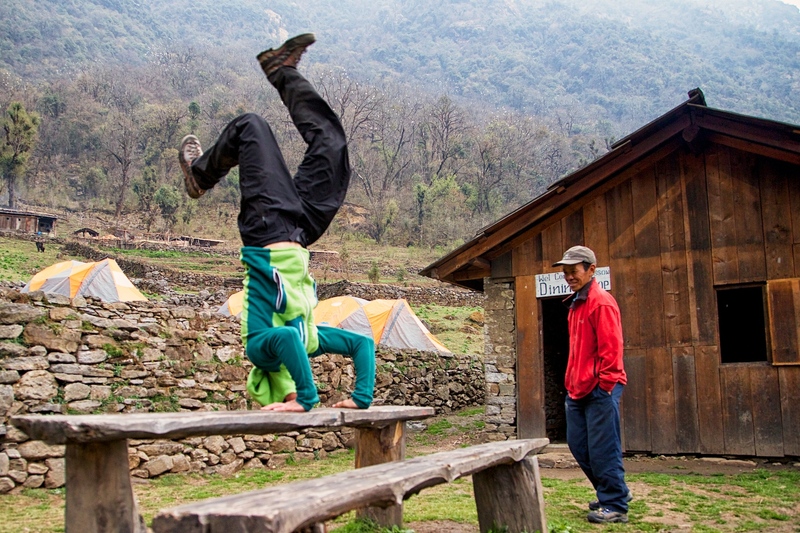 As we slowly worked our way through the farms dotting the mountainside, silliness prevailed. It seemed like we were in a constant state of goofing around and dancing. Everyone was in a fun mood despite the wet weather. 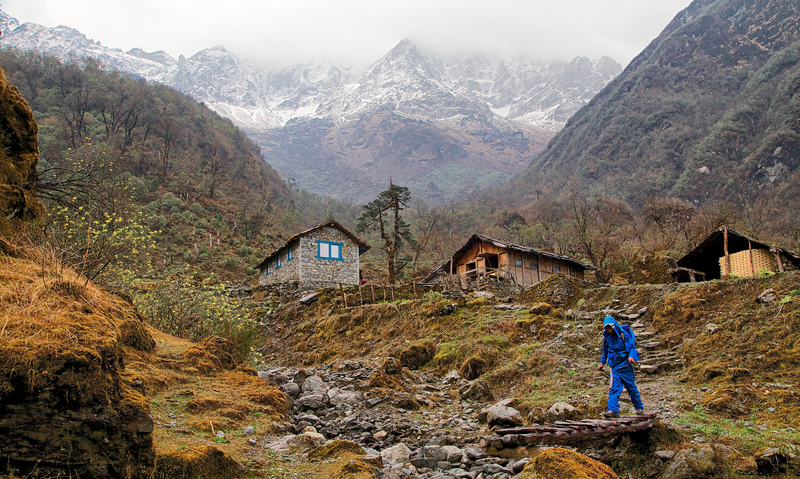 Dawa walks toward Lukla after lunch. We had crossed the mountain ridge in the background earlier in the day. Pasang, Christen, and Karma break out into spontaneous dance. 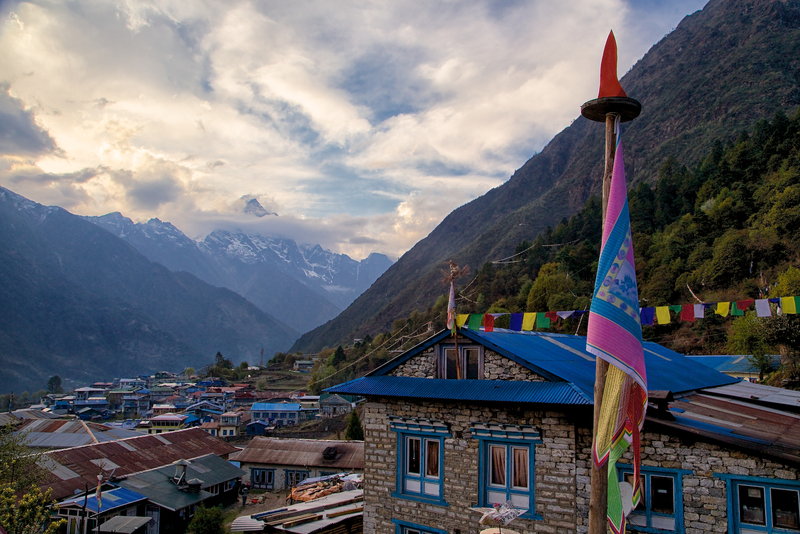 Lukla welcomes us back in style with a beautiful view. 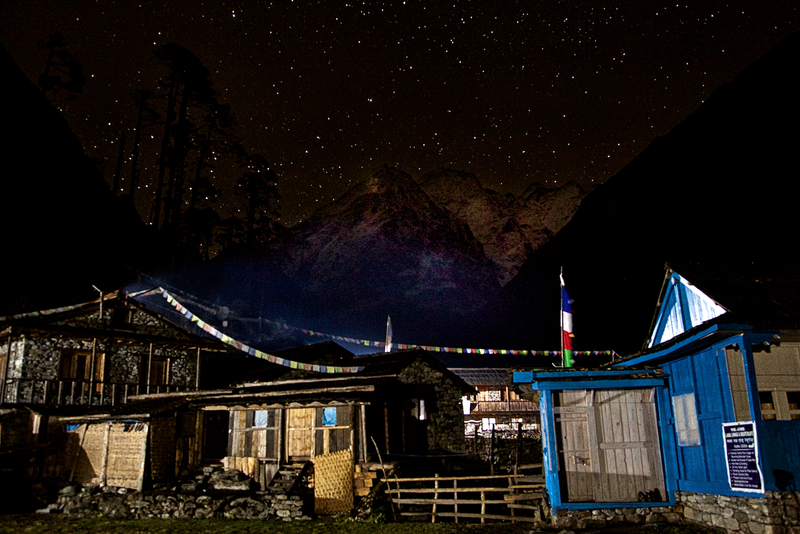 The last night of a trek is always special for one reason or another. 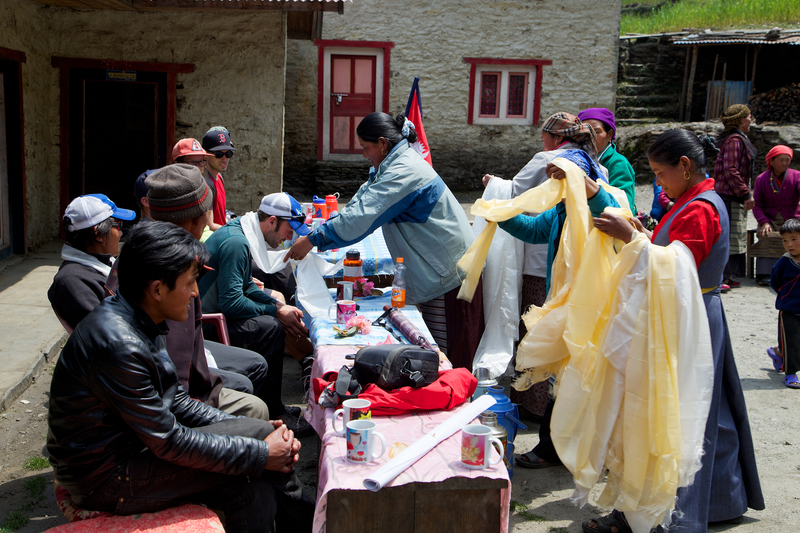 In our case, the trekkers decided to do something nice for the porters and guides. Through the entire trip, they had been serving us at every meal. Matt had the brilliant idea that we should take a turn serving them dinner. The thought was nice, but the lodge owners were (understandably) weary of letting a group of clumsy, untrained, western tourists into their kitchen. We settled for a compromise. We had all of the staff order what they wanted off the menu and had a large meal all together to celebrate. They even let us buy the beer (and Red Bull for those who do not drink). Kami, Matt, Ang Rita, and Dawa loosen up with Everest Beer and Red Bull. What started as a warm, relaxed dinner with friends turned suddenly into a West-meets-East dance party, complete with Everest Beer, Cheap Canadian Whisky, Red Bull, traditional Nepali music, and yes, Justin Bieber. 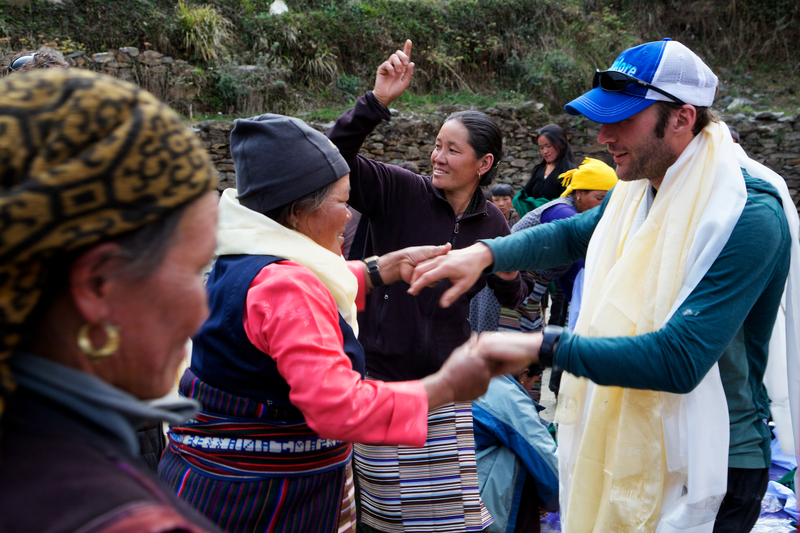 Christen even joined the staff in a confusing, if not mind-numbingly lengthy, traditional Sherpa dance. It may be what drained all of her energy leaving her vulnerable to the rabbit trap that would snare her in the middle of the night… but that is for another blog post. Kami makes the appropriate face when sampling Canadian Whisky. Karma catches his breath while waiting for the Justin Bieber reprise. 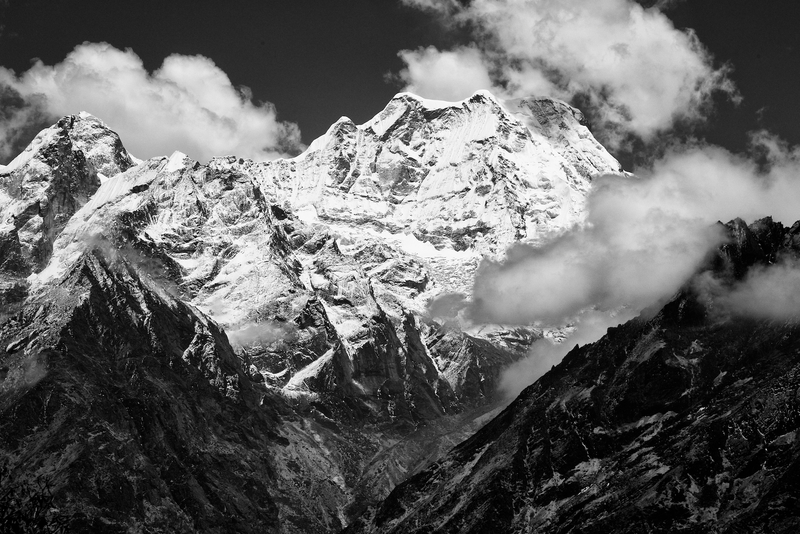 Once again, the weather in the Himalaya were to show us yet again how little we have in our own control. Lukla has a notorious airstrip. Not only is it nestled deep in a valley between a mountainside and a cliff, the weather frequently decides to muck up the flights. As we made our way off to bed (except Christen who was preparing to get caught in the rabbit trap), we all crossed our fingers for the weather. Flights had been cancelled for the previous three days. Glen told us that if we faced cancelled flights, our fallback plan was to hike an additional two days to where we would rent jeeps. Then, we would have to ride over treacherous roads for 18 hours a day for two days to get back to Kathmandu. I was crossing all the fingers I could. The jeep ride did not sound as much fun as it did when discussed in ‘theory’ at the start of the trek. All of our fears were for naught, though. We woke to a beautiful morning with partially cloudy, but clearing, skies. Our flight back to Kathmandu was to take off as planned. The general theme of our trip had been ‘timing’. Because of weather, groups who were as little as one day on either side of us failed to make their entire trip without a hitch. Mother nature was very kind to us indeed. Our final morning in Lukla was one to remember. 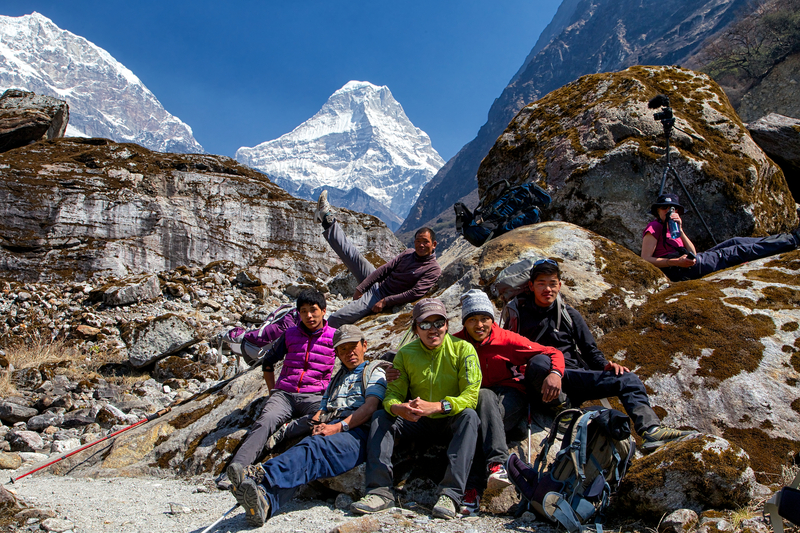 On the 12th day of the trek, Christen and I were to stay back at base camp in Khare while the rest of the group hiked to high camp, en route to the summit. They planned to get to high camp in the afternoon, rest for several hours, and then climb through the night to reach the summit early the next morning. 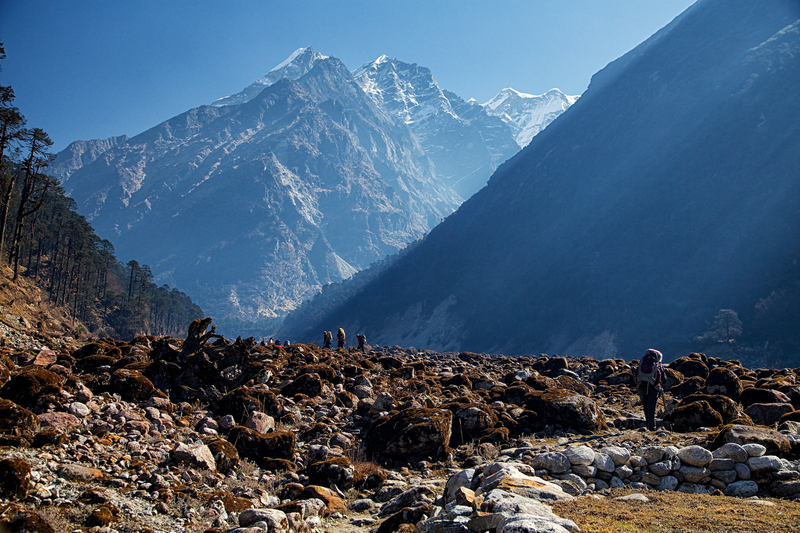 After that grueling task, they would hike most of that day back down to Khare. As I walked around outside the lodge, the air was thick with excitement. 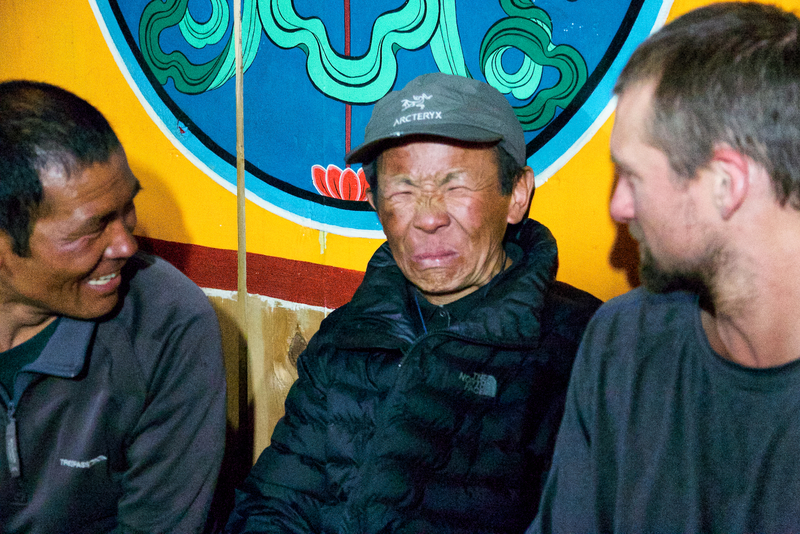 Matt and Andrew both had to exchange pieces of equipment that failed during the climb to Mera La the day before. I had felt for Andrew as we were hiking together the previous afternoon, when I saw his left crampon explode in a spray of metal rivets and bands as he was trying to knock some snow off. He felt better about the replacement pair he scrounged up, since his original pair looked like they summited Everest with Sir Edmund Hillary. Glen and Karma were up to their typical mountaineering warm-up antics, which were part dance, part chant, and part making goofy faces and chasing each other around like kids. Kami had finally decided to take his flip-flops off and was, to my surprise, wearing boots. (I later learned he was back to flip flops while lounging at high camp, though). Once again, I was feeling really good about the decision not to attempt the summit. Just watching the frenzy of everyone doing their last minute gear checks was more than my brain could take while fighting the thick fog of altitude sickness. I had not sleept well. I kept startling awake throughout the night out of breath. It felt like someone was sitting on my chest when I would try to sleep. 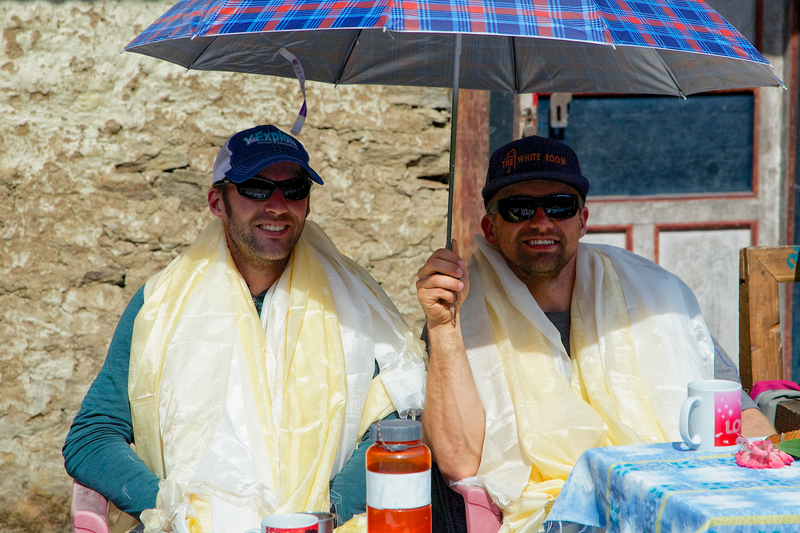 As the group said their farewells on their way up Mera peak, Christen and I settled in for a day of waiting and rest. We decided to hang out at Khare for one more day and then head back down to Khote, over 4000 ft below, where I would hopefully recover and we would wait for the rest of the gang to meet us after they summited. 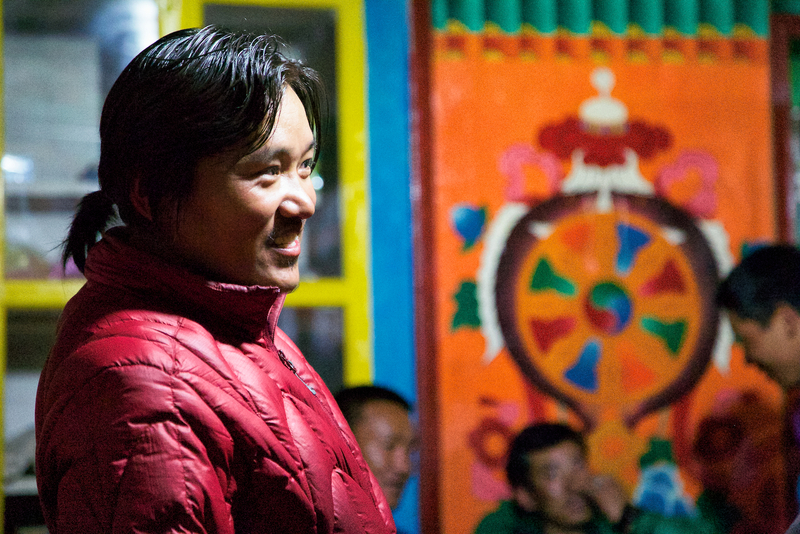 As we sat and had tea in the chilly dining room, we chatted with Pasang about his previous two days. While the rest of us had been acclimatizing and resting, he had taken on two sets of clients and summited Mera Peak two days in a row! I couldn’t even retort that I was by far the oldest member of the trek. I had just learned that Pasang is only a few months younger than me. 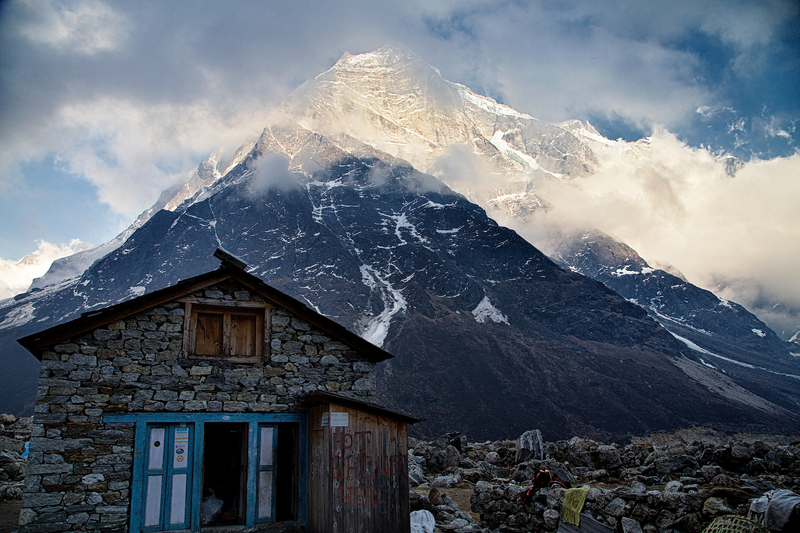 In the early afternoon, the weather started changing rapidly before a snow storm moved into Khare. 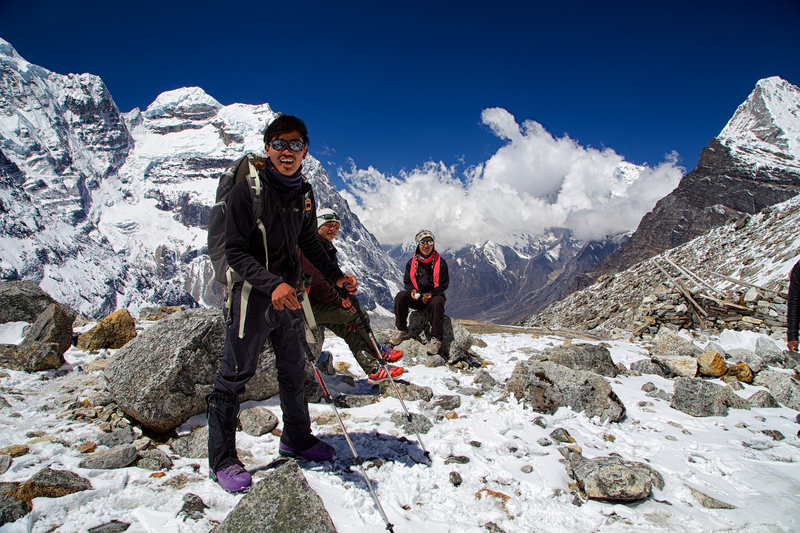 The next morning, Pasang, Sonam, Christen, and I ventured back down the trail making our gradual descent to Khote. It felt a little strange leaving the rest of the group behind us, since we were always bringing up the rear. We were also a little worried, since it had started snowing in the afternoon the day before in Khare. 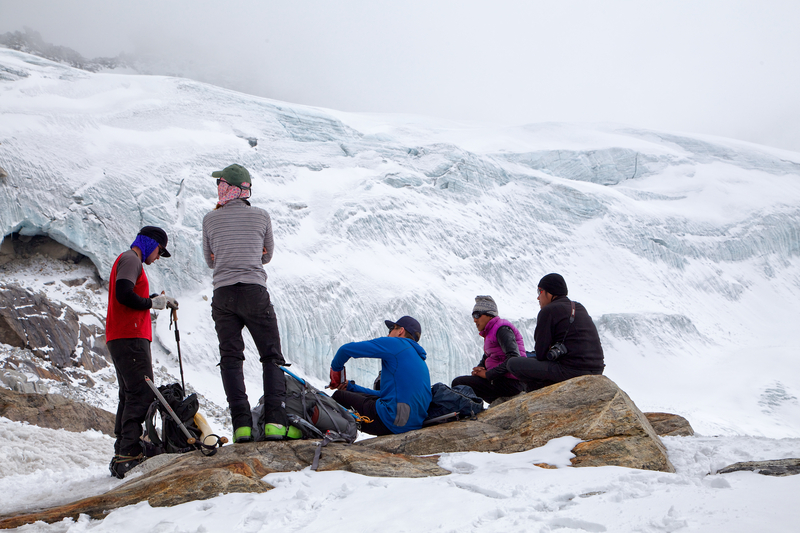 We did not know if the team would be caught in a snow storm while at high camp or if they were above it. Christen and I were both a little low-energy as we made our way. The weather started out sunny, but deteriorated quickly throughout the day. 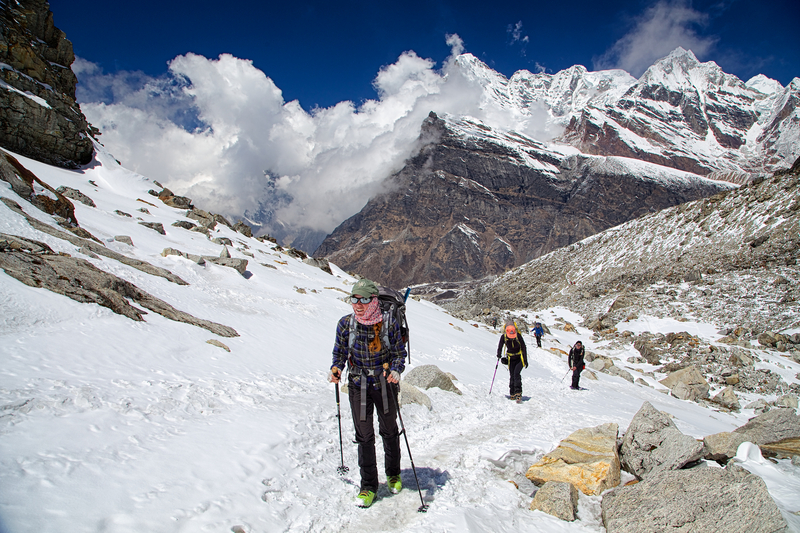 Christen and Pasang gradually make their way down towards Khote in the fine weather of the morning. The rest of the group was just reaching the summit. 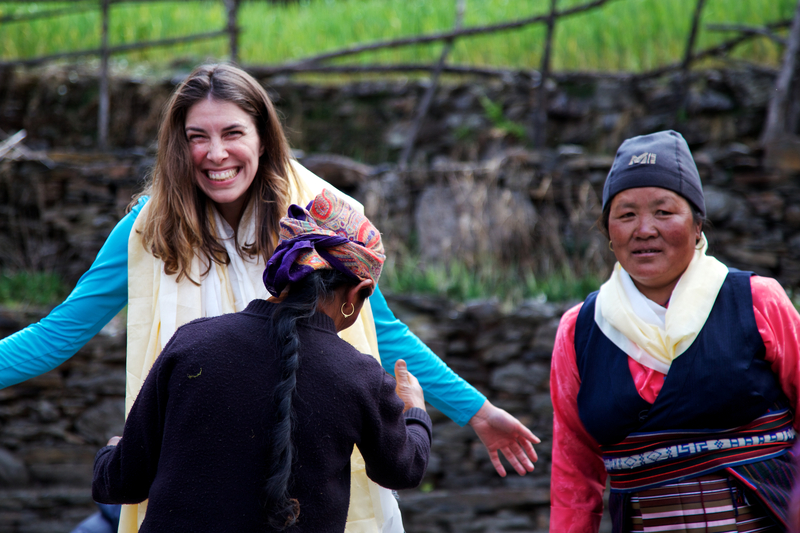 After a quick lunch in Tagnak, Christen tried to get into a dice game with some locals. Sonam would not let her, to her chagrin. Gambling is illegal in Nepal, he explained. I do have to give him credit. For a 21-year-old man, he held his own in corralling Christen away from something that looks fun. The weather was also starting to turn very quickly. It was getting windy, and we were starting to see some rain drops. That probably motivated her more than anything. As we continued along the river and starting nearing Khote, we met a tour group from England. They were a friendly, talkative bunch, and they were asking about the camera equipment. I explained the documentary and some of the goals that Karma has for his business, employees, and Sibuje. 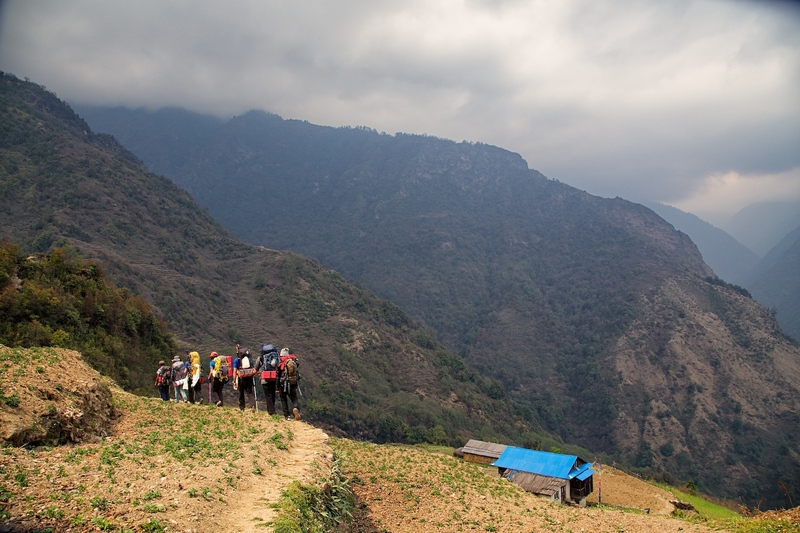 One of the English trekkers said he was extremely happy to hear that Karma ensures that his porters carry loads below the legal limit, as he was personally disgusted to see how much weight some porters are asked to carry by their companies. I felt extremely relieved when they were excited about the documentary we were capturing. I had been worried about whether we had enough to make a movie people would even want to watch. 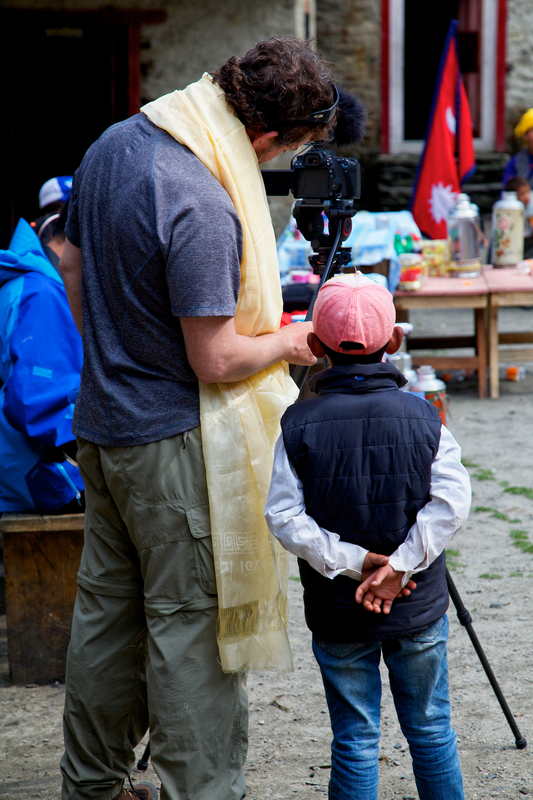 Making the film while also trying to manage the demands of the trek was turning out to be harder than I had imagined. I was relieved beyond words that other westerners could “get” what I was trying to say. 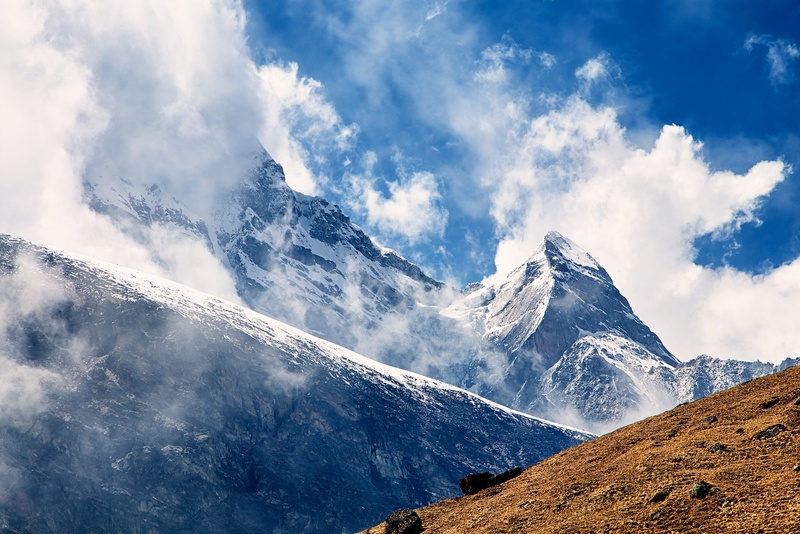 Weather changes extremely quickly in the Himalaya. Within a matter of minutes, a thunder storm swept up the valley and started to drench Khote. We arrived in town just in time. When Christen and I stumbled into Khote, I had one mission. I went straight for a shower. I do not think I have ever had a more satisfying shower in my life. Even though it was from an old paint bucket with a tiny spigot on the side sitting on a shelf in what looked like a tool shed, the water was hot, and it felt like it was cleansing my soul. Of course, when you only have 3 showers over the course of 18 days, they feel like ultimate luxury. 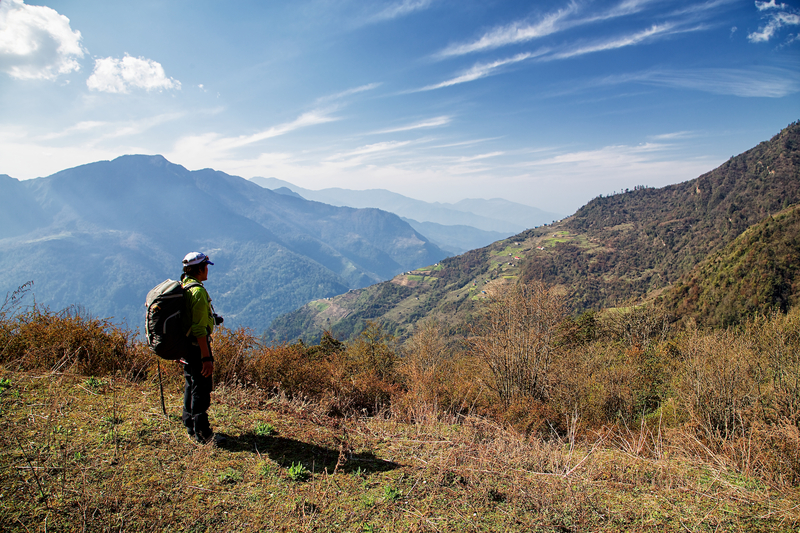 I mentioned in a previous post that “rest” days on a Himalayan trek are rarely just that. 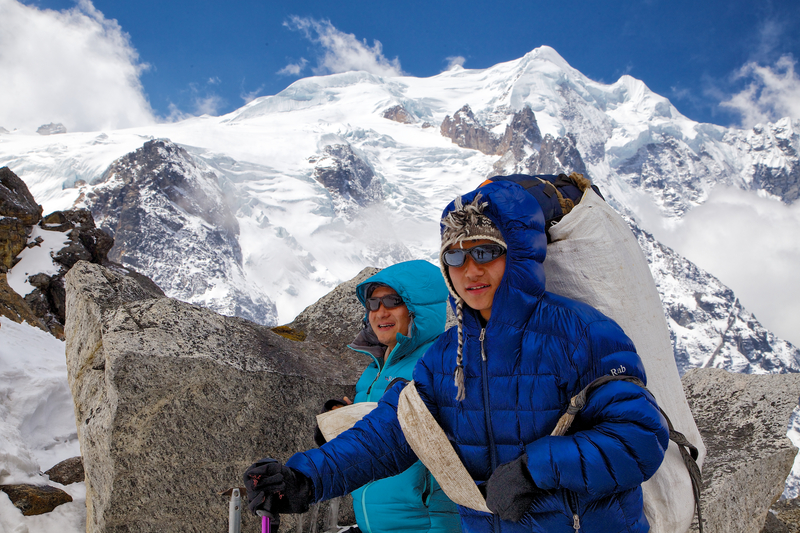 Usually, they are used to hike around and acclimatize to the altitude. Since we were on our way down and waiting for the rest of our group, Christen and I lazed around and had a magnificent day of laying on the beautiful grass, reading, hanging out by the Tolkien-esque water fall, and catching up on days of nasty laundry. On top of that, if you are going to have a rest day anywhere, Khote is hard to beat. 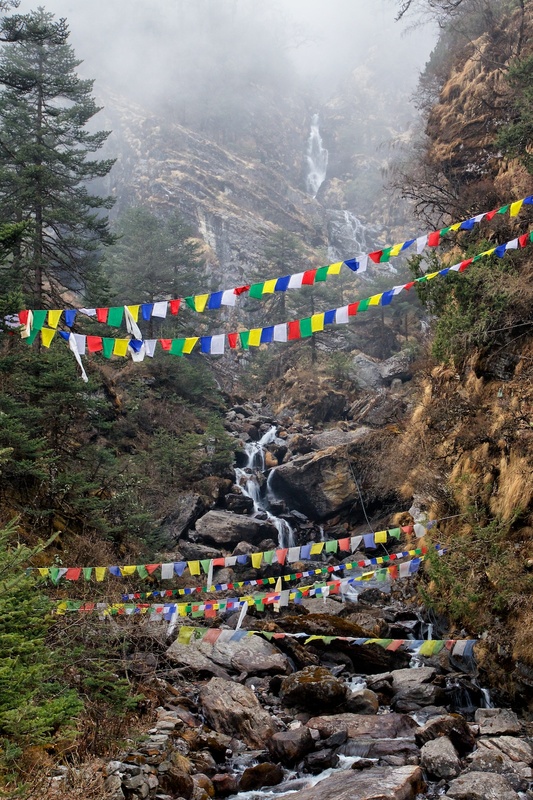 The sound of rushing water is everywhere, the air is clear, the grass is soft and green, and there are not rivulets of questionable brownness running down the hillside everywhere like in Khare. Khote is an amazingly peaceful place to enjoy a rest day. 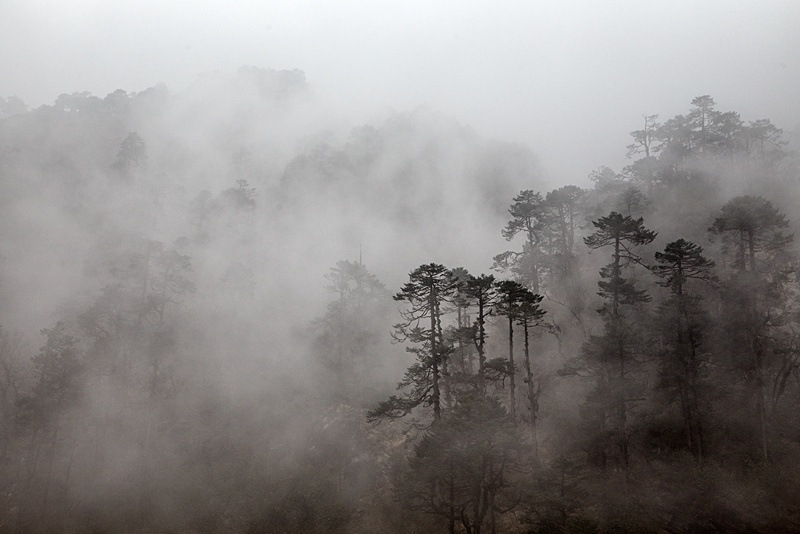 The mountainsides around Khote are covered by beautiful trees that reverberate a mystical quality in the afternoon fog. 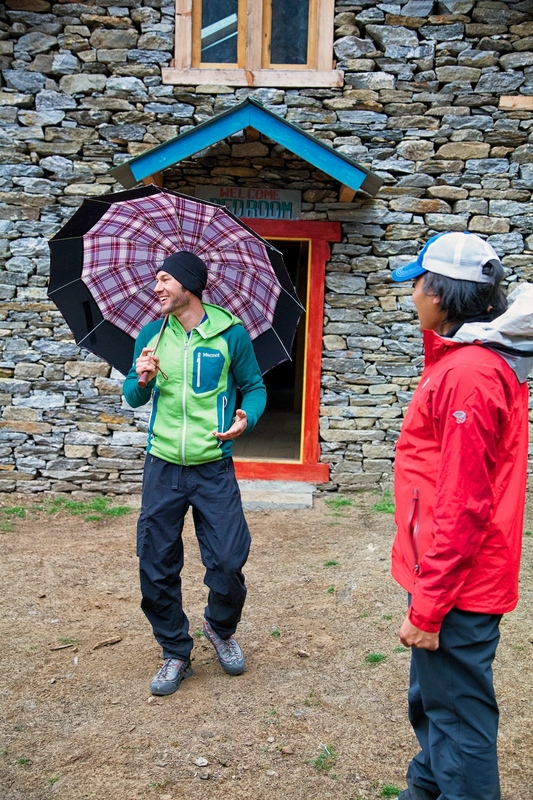 In the afternoon of our rest day, the rest of the team made their way into Khote. Amazingly, everyone looked even skinnier than when we saw them two days ago. The summit seemed to melt the calories right off them. Karma, Matt, Andrew, and Becky all made it to the summit. In keeping with the general theme of the trek, the team hit the perfect weather window. They had mostly clear weather (they were above the storm that pelted us in Khare), in contrast to the groups going up before and after them. Unfortunately, Becky was starting to take her turn with the dreaded trail sickness. Because we had been getting such good weather, we did not have to use any of our optional lay-over days yet. Given this, we all elected to stay one more day in Khote to help Becky recover and to give the rest of us time to catch up on much deserved reading and laundry. Ironically, when you are on a trek away from all of life’s daily chores, they can still pile up on you! Dawa and Sonam relax in Khote. Matt and Andrew tell stories of the summit. 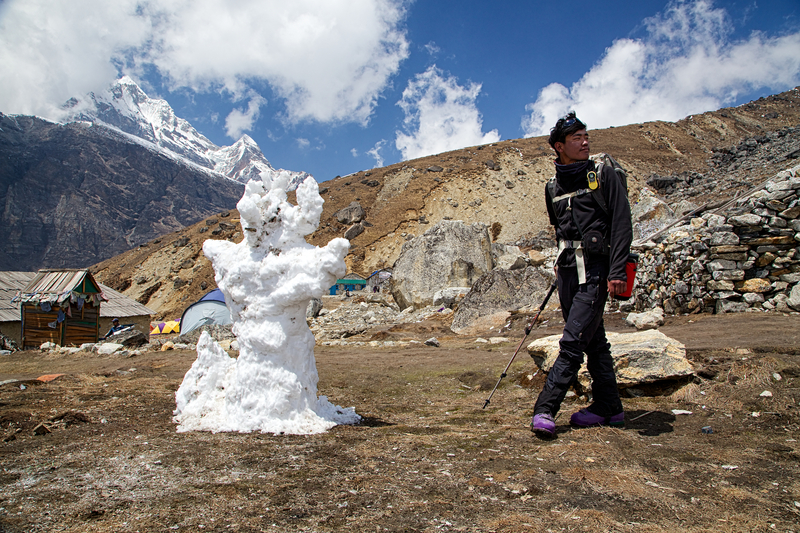 Here is a little time lapse video taken in Khare, the base camp area for Mera Peak. 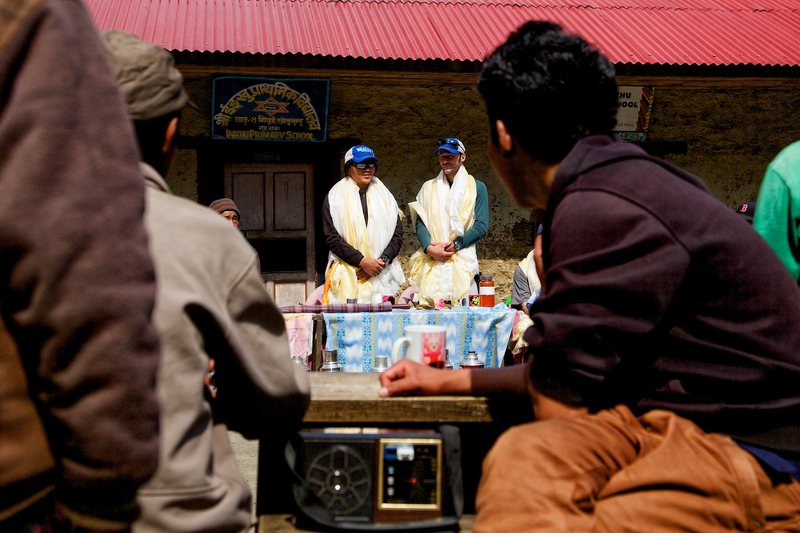 The audio track is from a Sherpa song and dance performance by some of the villagers we met in Sibuje, Nepal. 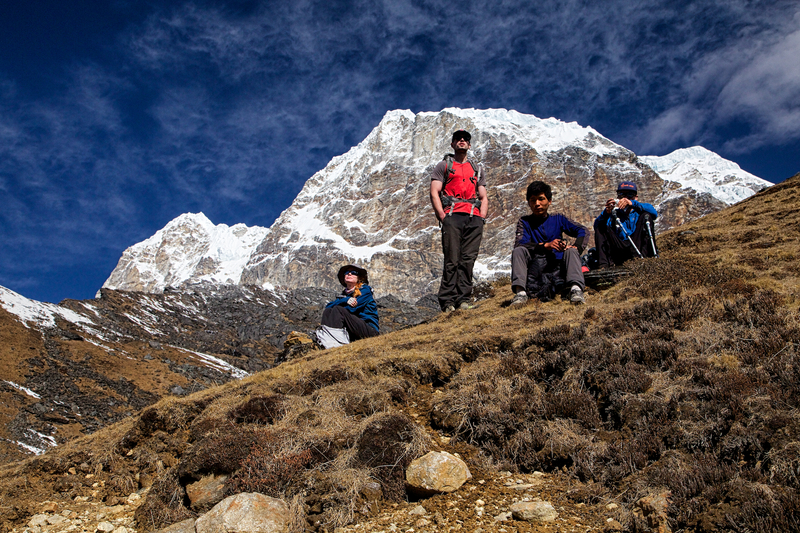 Day 6 of the trek started with bright blue skies and high spirits. 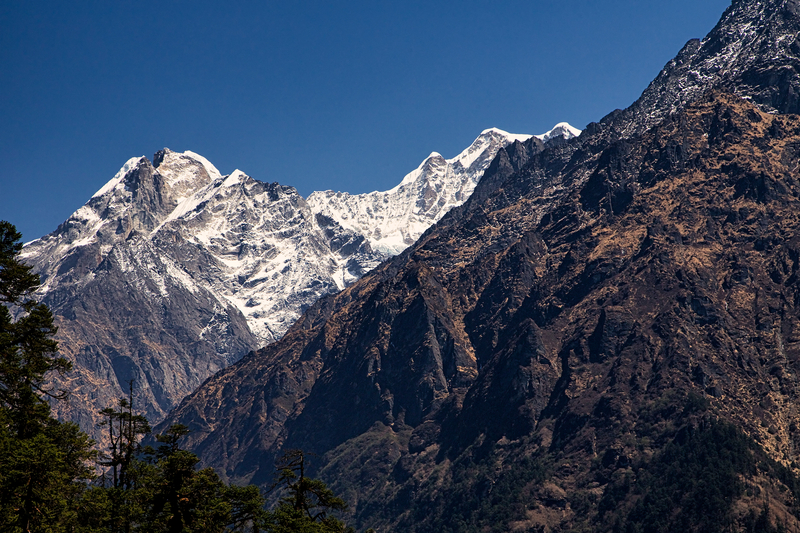 Although we had been following what seemed like a roller-coaster track built into the sides of Himalayan ridges, the word was that we would start to gain some more elevation overall in the next few days. Mind you, we would still have to do some serious ups and downs as part of the elevation gain. Karma looks back toward Sibuje as we continue our steady, roller coaster-like climb. During a pretty serious uphill section early in the morning, we met a farmer from Sibuje who just happened to be ‘pasturing’ his cows along side the steep trail in a rhododendron forest, 4 hours trek from his home. At the top of the pass, there was much celebration. Christen turned to me, stunned, saying something like, “I know that can not possibly be Nicki Minaj!” Ang Rita Sherpa had just turned the music on his little Nokia cell-phone, and he was proving just how disturbingly deeply western pop culture has spread into what we foolishly thought was one of the world’s last strong holds against the likes of Justin Bieber. And yes. Justin Bieber was next up on the cell-phone play list. The next thing I knew, Glen had Kami on his shoulders and was chasing everyone around. Nothing is as fearsome as that dynamic duo. Glen and Kami do the only respectable thing you can do while listening to Justin Bieber at high elevation. Ang Rita shows off the sleeping area we had at the spot lovingly named by us as “the Tick Farm”, where Glen found a large tick trying to burrow into his back. As we ended day 7, we walked along a gigantic river gorge, picking our way through boulders the size of houses and buses. Karma explained to us that the gorge we were walking up ended in a glacial moraine and a glacial lake that we would see on Day 8 in Tagnak. 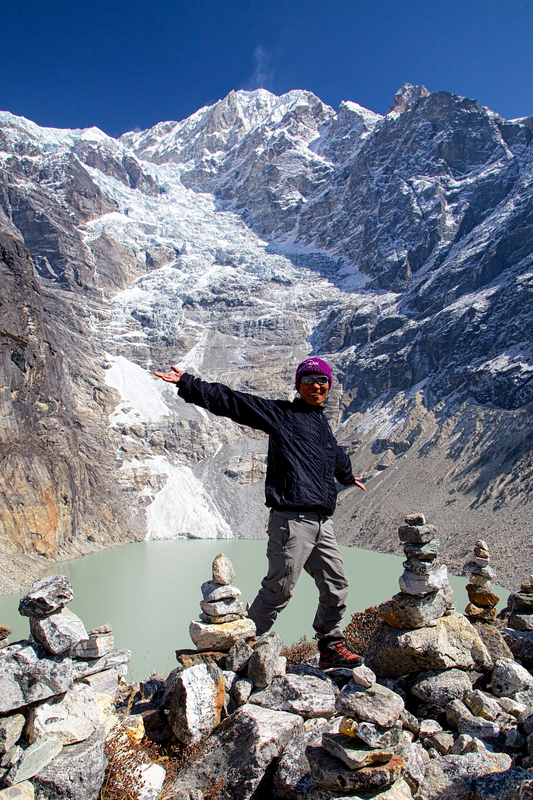 15 years ago, a huge ice chunk broke off the overhanging glacier above the lake. 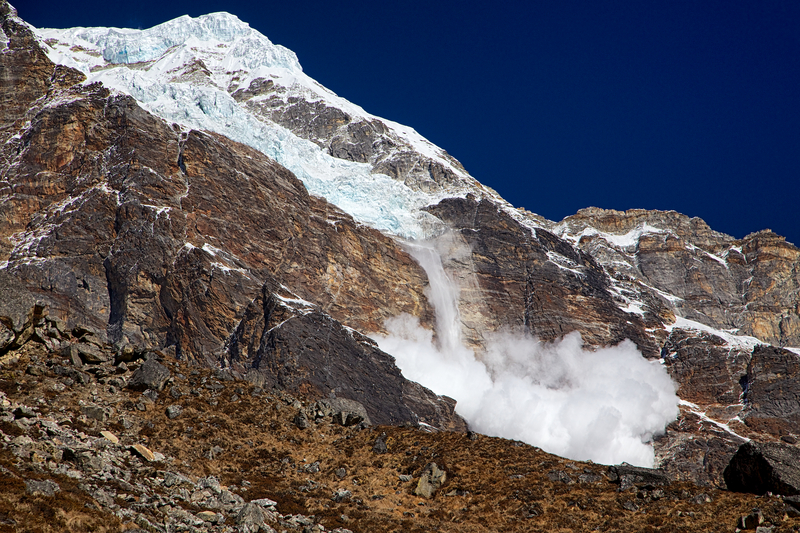 This building sized block of ice caused a huge wave to come overflowing out of the lake, down the river gorge, and far into the Terai, the lowlands of Nepal, where hundreds of unsuspecting residents were killed. As we continued up, we glimpsed our first view of Mera Peak. It is the triple-humped snow-capped mountain on the top right of the photo. Christen picks her way through the boulders as she follows the trail along the river gorge. The next day, we were completely in the Alpine. Trees gave way to boulders everywhere, and the sun was impossible to escape. I thanked Glen silently multiple times for picking up the industrial grade sunblock with titanium in it. The day had us following the same river up the valley. We came upon a Buddhist monastery on the way, and Pasang and Karma offered prayers up for safe travel. Pasang prays for a safe journey. The scale of the landscape in this region is almost beyond comprehension. Distance was difficult to judge. It felt cozy and intimate while still making me feel tiny and insignificant. 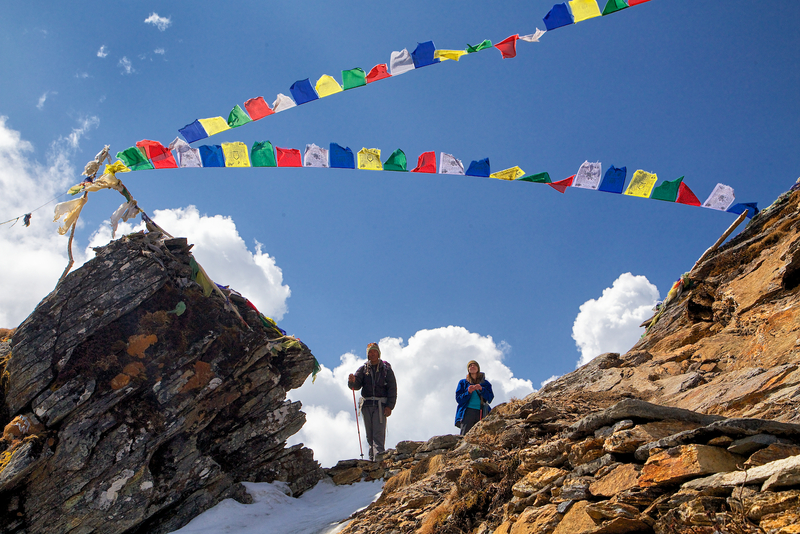 When we got into Tagnak, at about 14,200 ft above sea level, it felt like we were in the heart of the Himalaya. It was fitting that Glen gave us the high altitude safety briefing that night. 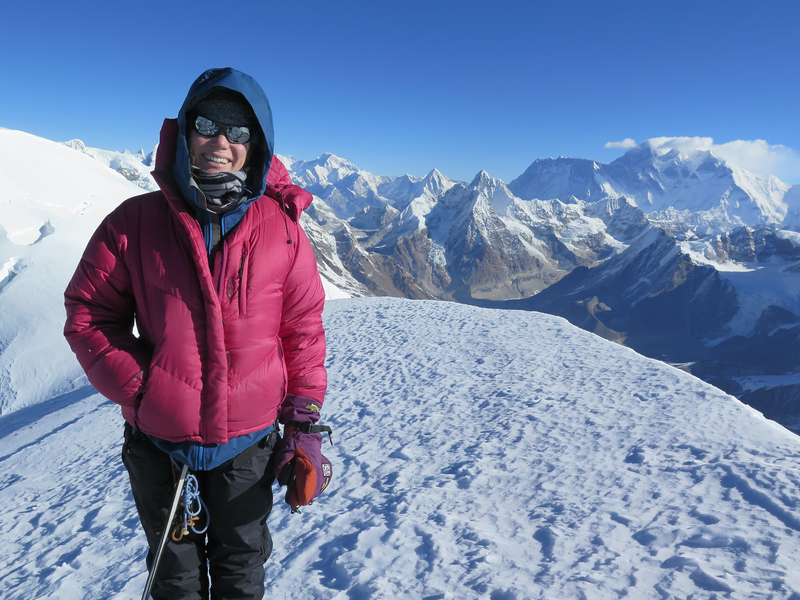 He explained that if symptoms become serious enough, the best treatment is to descend at least 1000 ft below where you slept the previous night – not a particularly easy feat while suffering from altitude sickness, I thought. The group begins the 8th day by following the river valley into the alpine area. Chongba, Kami , Karma, Ang Rita, Dawa, Pasang, and Christen take a quick break. 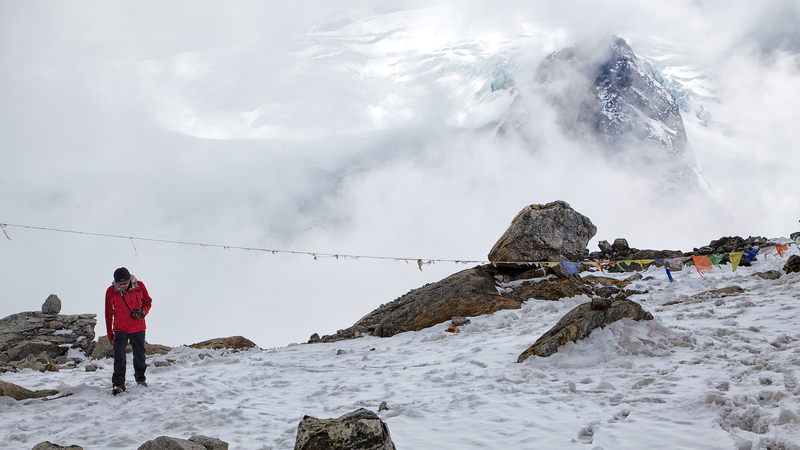 Tagnak is a stunningly beautiful place surrounded by peaks up to 23,000 ft.
Christen does her laundry outside, Himalayan style. After spending almost 48 hours in Sibuje, I was well rested and excited to start up the valley towards the high alpine environment. 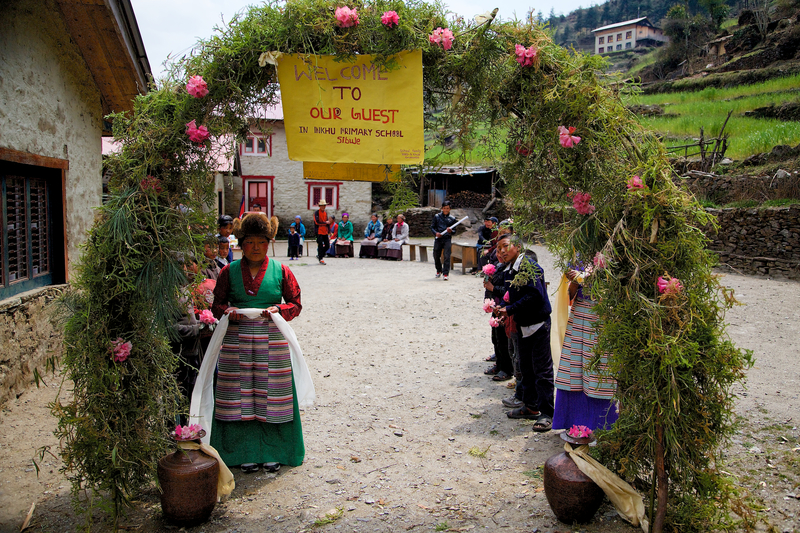 At the same time, it was difficult to leave the people from Karma’s home village behind. 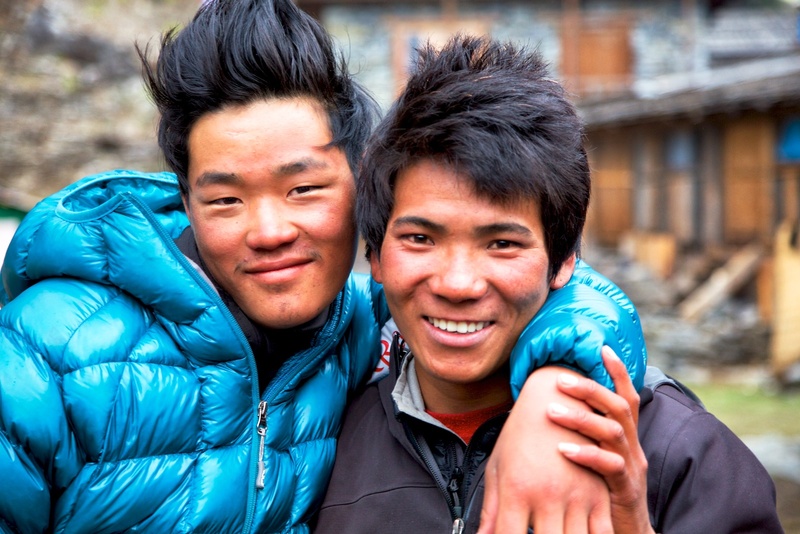 Despite the difficult lives they lead, they shone with happiness and warmth to all of us. In just a short time, I felt like I was welcomed in as family. Andrew receives a customary kata scarf as a token of good luck on the journey. Christen saying goodbye to some of her new friends from Sibuje. 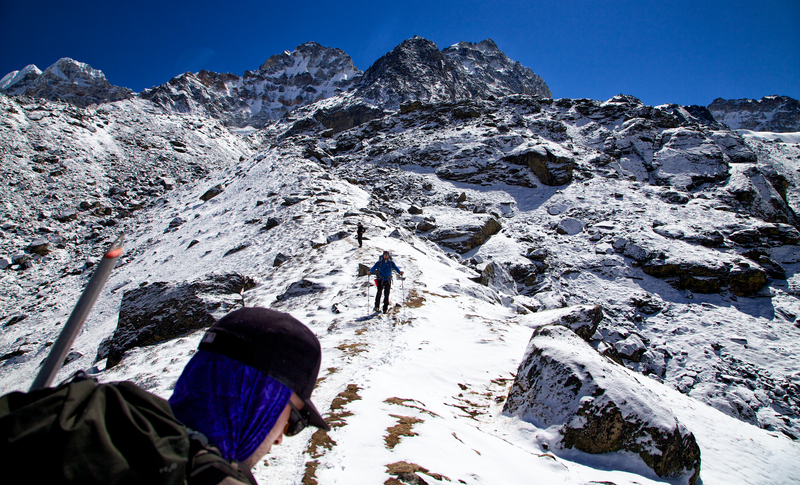 As we began our hike, which would be a relatively short 3 hours, we started traversing the gigantic ridge lines leading up the valley toward Mera Peak. About 30 minutes up the trail, we came to the village’s water wheel, which is used for grinding buckwheat into flour. When water is low and it can not operate, the villagers must grind it by hand. Karma showed us how to do it when we were eating lunch at Pasang’s house before our departure. It looks like back-breaking work! Immediately after the water wheel, we had to climb a very steep trail that went up a slope that had been a recent landslide, and then go back down another steep trail right after. We were to experience this joy over and over again throughout the day, and most of the next. These trails were some of the steepest of the trip, and certainly some of the steepest I have ever hiked. The group sets out from Sibuje. The next day and a half would see us climbing up and down steep trails as we traversed the ridges shown in this photo. These were some of the steepest hiking trails I have been on. As we continued through the day, we walked through some amazing forests. We started seeing rhododendron trees blooming everywhere. Everyone was in high spirits, but the weather reflected a gloom that everyone seemed to be feeling about the tragedy on Everest. Karma was warm and immensely friendly, as always. 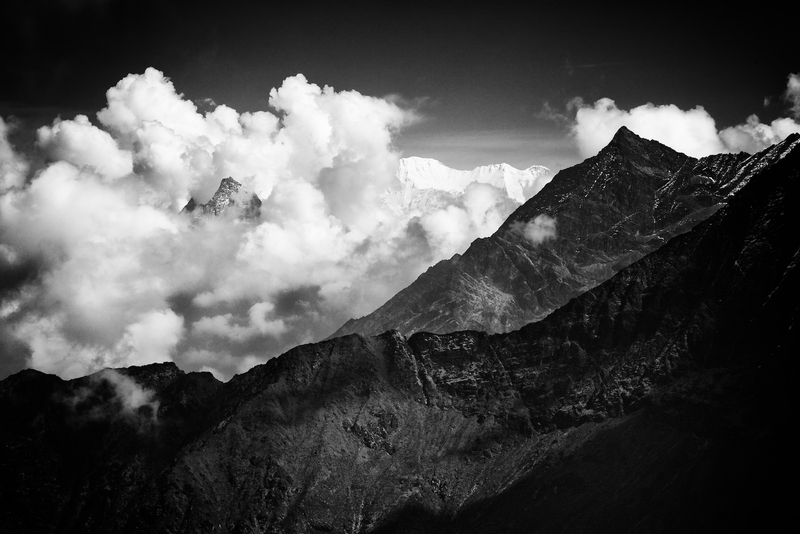 Yet, it seemed he carried a sadness because of the avalanche on the world’s highest peak. Details were still coming in piece by piece, and there was some conflicting information. I think he also was missing Sibuje already. He does not get to come back as often as he likes, having to reside in Kathmandu to run his fledgling business. At every vantage point, he would stop and turn to gaze on his home village. 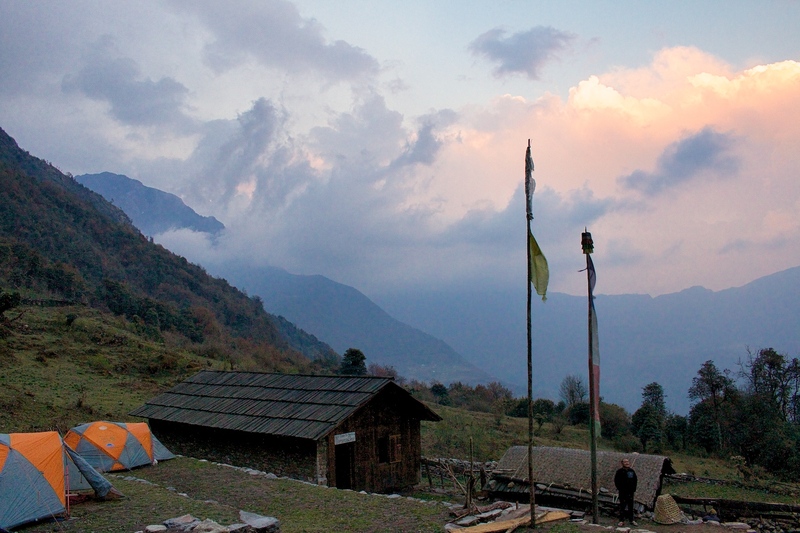 The end of the day brought us to a lone lodge situated in a steep valley. The group was really starting to bond, and people were acting silly as we started to experience the first light rain of the trek. Our lodge for the night was 3 hours from Sibuje. It is run by a family from the village. Kami and Christen started the fun off with some carefree mock kickboxing. Glen emerged from his room carrying quite the stylish umbrella. As if to show that style does not belay agility and functionality, he then quickly did a head flip over a bench. Remember kids, he is a professional guide. Do not attempt any dance moves or stunts demonstrated by Glen. Kami shows Christen his kickboxing skills. Glen shows off his impeccable style with his fancy umbrella. Guides do not like to get wet. The morning on our full day in Sibuje was a delight. We learned much from some of the elders about the village, its people, history, and current challenges to daily life. After lunch, we were in for a special treat. Sibuje now has a primary school teacher, who teaches the village kids through grade 3. Although his salary from year to year is not guaranteed, as he is paid by a foreign NGO, not the Nepali government, he provides a tremendous resource to the children. One of Karma’s Japanese friends bought school uniforms and donated them to Sibuje. We were invited to join a celebration all afternoon at the school, where Karma and Glen gave brief speeches about the Karma project before Karma gave the happy kids their new uniforms. Upon walking into the playground, we were immediately greeted as special honored guests. The people of the village went well out of their way to show their gratitude for what the Karma Project is doing for their village. We were seated at a head table, and literally every family welcomed each of us with a traditional silk kata scarf. It was more than a little funny to watch all of us try to manage the huge mountains of scarves around our necks. 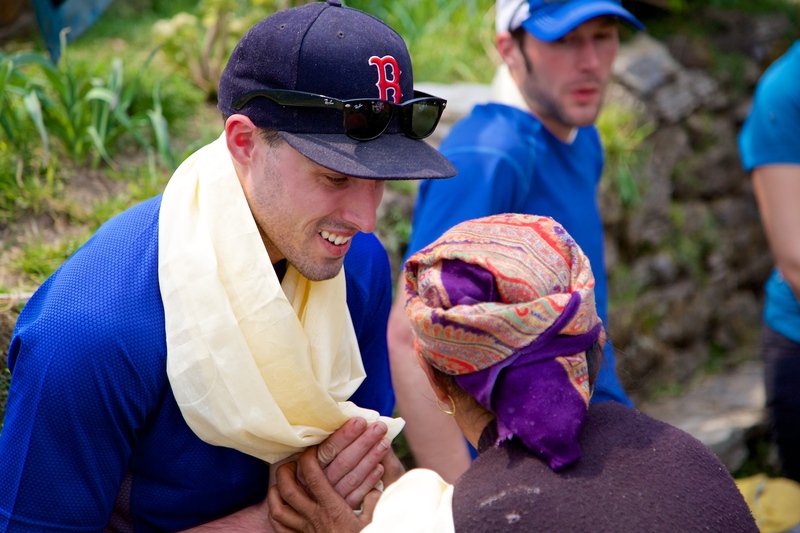 After we were all settled in with our kata scarves and tea (you can not sit down as a guest in Nepal without tea being readily offered and refilled), Karma and Glen spoke a bit to the village about the goals of the Karma Project. Seeing the gratitude of the people of Sibuje in this way was truly an unexpected treat. Something that started as one friend asking another for some help with his village has blossomed into a truly wonderful and impactful project. 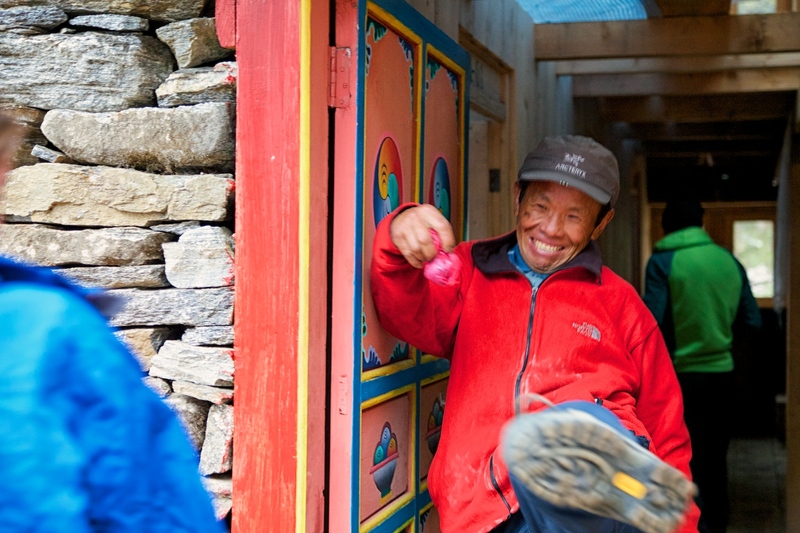 Like everything they do, when Sherpa people welcome guests and say thanks, they spare no effort. After the ‘official’ part of the afternoon was over and speeches were made, we were all treated to some dancing. 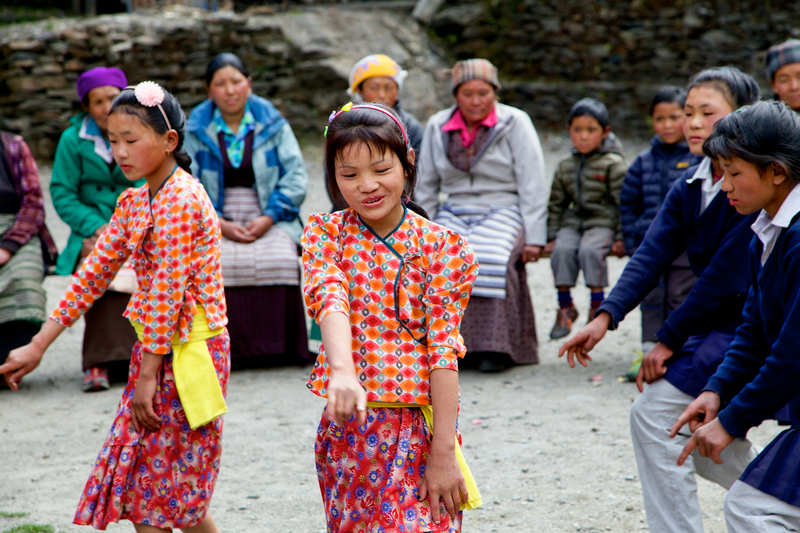 To begin, some of the school children took to the open space and danced to a popular Nepali song that Christen and I learned early on in the trek. The main words of the chorus are, “…slowly, slowly, slowly..” It became our mantra for the trek. Next, some of the adults demonstrated their dancing moves. 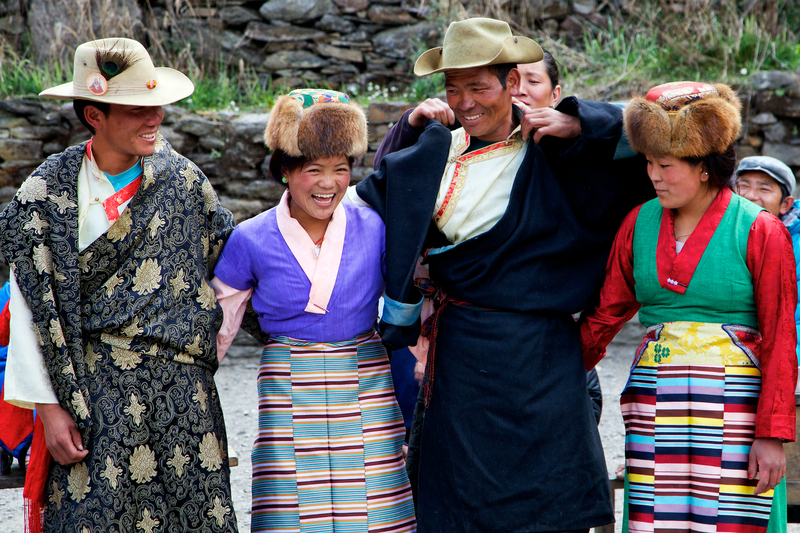 We were even treated to a traditional Sherpa Dance, where four villagers (including one of our porters, Pasang) dressed in traditional clothing and chanted an almost haunting song. After the talented dancers finished their displays, the rest of us were invited to join the fun. Several generations of people took part; no one was spared the embarrassment of showing just how badly they move across the dance floor. Glen even gave a few lessons in silliness, something for which he could easily receive an honorary doctorate. During the fun, I was never wanting for an assistant. It seems that Sibuje has several aspiring photographers/filmmakers. Christen gets some help managing her kata scarves, so she can dance more safely. My new Assistant Director provides some wise oversight of the filming. Photo Credit: Christen Babb. At the end of the afternoon, the shared sense of friendship and family was impossible to ignore. We were all welcomed with open arms. However, the thing that was most heartening to see was how the kids of the village were already directly benefiting from the Karma Project. What started as Glen helping his friend Karma has now grown well beyond that relationship. People from all over the world have jumped in to help to make the lives of the people of Sibuje a little bit easier. The children of Sibuje show off their beautiful new uniforms.